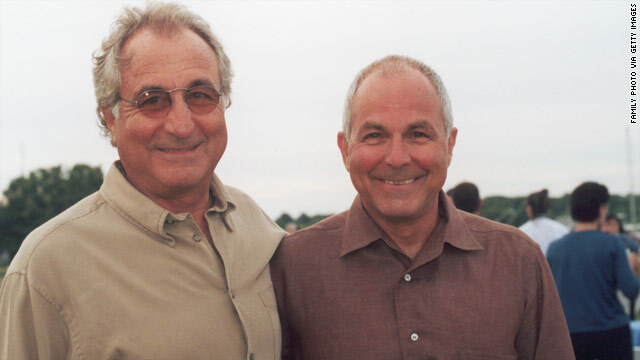 Peter Madoff, right, and brother Bernard Madoff are shown in Montauk, New York, in July 2002. New York (CNN) -- Peter Madoff, brother of Bernard Madoff and chief compliance officer of Bernard L. Madoff Investment Securities, is the subject of a criminal investigation, the U.S. attorney's office in New York confirmed Thursday. In a letter filed this week in federal court in Newark, New Jersey, Peter Madoff's attorney, Charles Spada, says that the investigation was the reason that his client invoked his Fifth Amendment right against self-incrimination at a deposition in a related case in November. Spada said he had been informed of the investigation into Peter Madoff's involvement in his brother's Ponzi scheme a week before the deposition, at which Peter Madoff declined to answer more than 290 questions. "Given the circumstances and intensity of the criminal investigation, one can hardly question defendant's constitutional right not to answer questions about his brother, Bernard Madoff, his work at BLMIS ... and virtually any related topic for fear that such answers might 'furnish a link in the chain of evidence' for a criminal prosecution," Spada said in the letter to Judge Madeline Cox Arleo. The deposition was for a lawsuit brought against Peter Madoff by the Lautenberg Foundation, which says it lost all of its investment with Madoff Investment Securities: $7 million that the firm told the foundation had grown to an estimated $15 million. Spada's letter was filed in response to the foundation's move to have Madoff sanctioned for failing to be "cooperative" in the deposition. The attorney says the Lautenberg Foundation -- a charitable private group headed by Sen. Frank Lautenberg -- is an effort to "unfairly jump ahead of thousands of other investors" who also are seeking damages from Madoff Investment Securities. A separate lawsuit has been filed on behalf of all the business's investors, who have lost an estimated $200 million in the scheme. In March, Bernard Madoff pleaded guilty to 11 counts related to running the most massive Ponzi scheme in history and was sentenced to 150 years in prison. CNN's Jean Shin contributed to this report.